PORTLAND to BOISE – The outbound ride route was about getting miles under our tires as we looked for the fastest and most direct route (I-84) to Boise, ID. 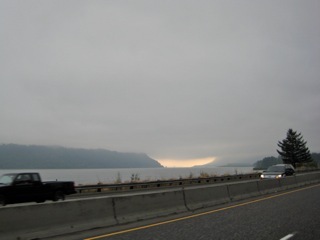 The day started off with a heavy coastal cloud layer, but the futher we rode through the gorge the sunny weather was clearly present in the distant east. By mid-morning the clouds burned off and as we rode up the gorge we stopped at a rest area prior to Boardman and met up with another group of riders/friends who were taking the northern route to the rally. We continued on along a more southern route and headed toward Pendleton and over the Blue Mountains of the Wallowa-Whitman National Forest. The crest of the range sits at 4193 feet just prior to La Grande and then we dropped down into the southeastern flank of the range and Baker City, home of the Hells Canyon Rally. We arrived in Idaho, the coast-less, semi-arid, mountainous state to near triple digit temps and stopped at a rest area where the Snake River meandered along the interstate to cool off. We made our way into the downtown Hampton Inn having to navigate around road blocks for a 3-on-3 basketball street tournament running over the weekend. As a side-bar, the Hampton Inn experience (price/quality/service) was the best we experienced on the entire trip. Major shout-out to Phil Cordell (GM) and team! We needed something to do and luckily for the group it was Friday night! We grabbed some “Boise Caviar” (at: Bar Gernika) i.e. some spicy lamb grinder and a drink mixture of cola and red wine. No thanks, I stuck to a local hops. Bar Gernika is a dark little corner joint, but a fav for Basque food. Some in the posse decided to doubled down on the croquetas and ask for extra spice because let’s face it – is there any better drunk food than spicy lamb?! The joint had a sidewalk patio and was in close proximity to “Alive After Five” and the “cougar” deck at the Reef “Tiki” Restaurant where we finished off the evening. 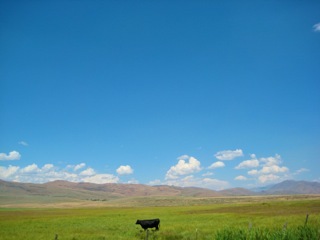 BOISE to IDAHO FALLS – We departed Boise fairly early and continued our route to the “Craters of the Moon National Monument.” About an hour outside of Boise we headed east on Hwy 20 and traveled through the semi-arid rolling hills landscape. About 18 miles from Arco, ID on Hwy 20/26/93 is the National Monument and we pulled into the visitor center to cool off. Even though we were at 5900 feet, the temperature remained in the 90’s. 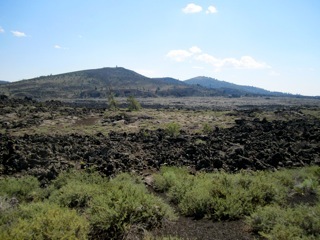 The Craters of the Moon is a geologic wonder. It’s a preserved volcanic landscape with craters, cinder coves, lava tubes and large fields on the Snake River plain. It’s quite the contrast in colors. After leaving the monument we continue east toward Arco and rode through part of the nearly 1000 sq mile Idaho National Laboratory (INL) complex located in the high-desert. For as far as the eye can see (~20 miles) there was nothing but sage brush and then a small industrial complex comes into view. INL manufactures highly radioactive plutonium-238 for classified national security purposes. According to the reports there have been more than 50 one-of-a-kind nuclear reactors built at the INL facility yet all but three are shut down now. More important from a tourist viewpoint is that we passed by the now famous EBR-1 (Experimental Breeder Reactor) which first produced electricity back in 1951 and was the design test-bed for a nuclear military. It’s on public display. 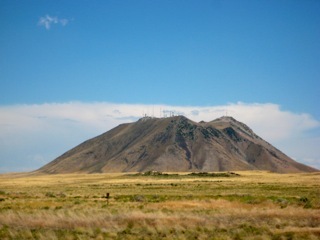 We continued heading east on Hwy 20/26/93 and rolled past “Middle Butte” which is this large cinder cone shaped mountain in the high-desert with every conceivable antenna tower on the flat top to broadcast or capture an electronic signal. Undoubtedly it provides the 4000+ workers at INL cell phone coverage so they can check their email. Evidently AT&T has yet to learn about this mountain as I had no service. Finally after some road construction delay’s we arrived literally at Idaho Falls and the Best Western hotel. Dinner was great at the Brownstone Restaurant and by moonlight and a small flashlight we made some late night foot peg adjustments before calling it a day. 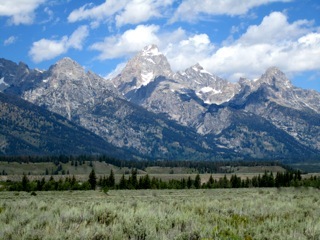 (via southern Yellowstone National Park entrance) – This day took us through northwestern Wyoming, via Jackson Hole and the Grand Teton National Park. We were most fortunate to have sunny weather to view a spectacular landscape rich with majestic mountains and blue clear lakes. The jagged Teton Range provides an incredible contrast to the sage-covered valley which Hwy 191 runs through on our way north to Yellowstone. Yellowstone National Park is always inspiring with waterfalls, Lodgepole pine and the thermal areas. The south road entrance passes the Continental Divide three times and the route passes five geyser basins. 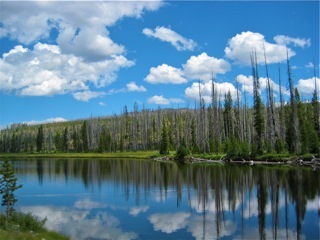 We drove by Lewis Lake and over Craig Pass (8262 ft) and then west to Old Faithful. It’s the world’s best known geyser and erupts at intervals from 40 to 120 minutes. We watch it do its thing and back tracked toward the East entrance through Lake Village and the Fishing Bridge where we were rewarded with panorama views of Yellowstone Lake. The lake is North Americas largest mountain lake at 20 miles long, 14 miles wide and 430 ft deep with average August surface temp of 60 degrees. We traveled around what seemed like the entire lake then progressed over Sylvan Pass (8530 ft) and finished out the riding day with about 50 miles to Cody, WY. The last hour of this route took us on the Buffalo Bill Scenic Byway which is a two-lane road in the rugged canyon carved by the North Fork of Shoshone River. 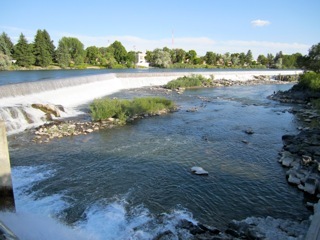 Just prior to arriving in Cody are a couple of interesting tunnels and the Buffalo Bill Reservoir which provides recreational activity for locals as well as some limited hydropower from the dam. With the sun setting behind us the scene made for some great photo’s. 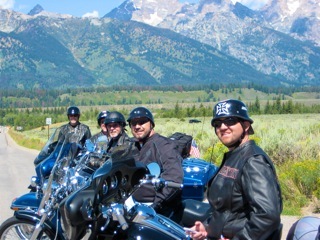 CODY to STURGIS/LEAD – It was our 4th day of adventure and Cody is a transition point between the forested mountains of northwest Wyoming and the plains of the Bighorn Basin. There is spectacular scenery in all directions from Cody, the Beartooth Mountains to the north, the Absaroka Range to the west and Wapiti Valley to the south. 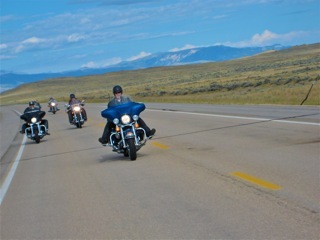 Our posse headed east on Hwy 20 to Greybull and picked up Hwy 14 which traverses the Bighorn National Forest. 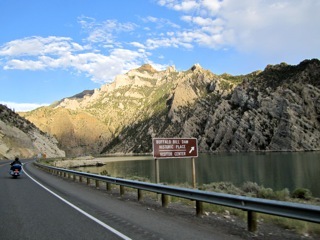 We all have our favorite roads and one that I really like riding is the Bighorn Scenic Byway (US 14) which connects the cities of Greybull and Sheridan and includes 45 miles of scenic mountain driving. Within the National Forest area, you’ll encounter grass prairies, evergreen forests, mountain meadows, rugged alpine peaks, dramatic canyons, arid desert lands and cascading waterfalls — all within a couple hours journey. 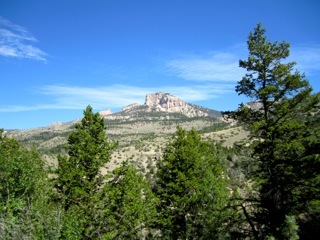 The Cloud Peak Wilderness area, is quite unique and diverse. I’d like to spend more time exploring the area rather than quickly rolling through on a motorcycle. 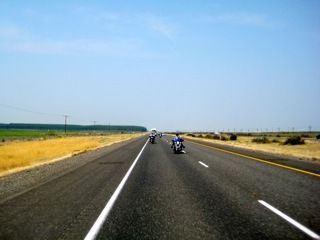 We connected onto I-90 and headed east toward Sturgis. Although the interstate is fast it’s somewhat of a boring ride until you get near Spearfish and the US 85 junction which routes riders south into Deadwood/Lead. We had a cabin south of Lead, located near Recreational Springs. 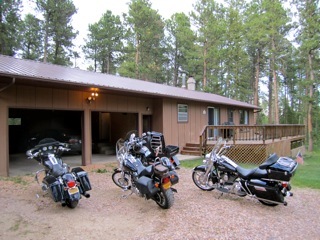 Although it was a bit of drive into Sturgis it turned out to be a really sweet setup! 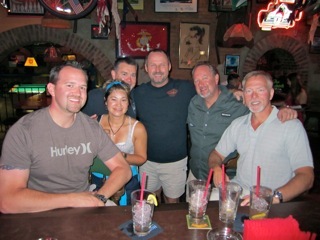 70th Sturgis Rally Travelogue – Part 2 HERE. Photos taken along the route.